In 2009, the Chrysalis Ultravox albums got what were called “Definitive Edition” DLX RMs as 2xCD packages with a few previously unreleased early mixes tossed into the blend of B-sides, remixes, and live tracks that comprised the series. They all came in “O-card” sleeves, and featured the unmolested album on disc one with all bonus material segregated to side two. I’m fine with that gambit as long as there was not material being held out of the package strictly to maintain the original album integrity on disc one. We’ll get to that later. In the last five years, I re-bought “Vienna,” “Rage In Eden,” “Quartet” and “Monument” but was unable to source “Lament;” the last Ultravox album I would be buying again in a DLX RM. Buying “UVOX” was painful enough the first time! Fortunately, the band, for reasons unknown, re-issued just the “Lament” DLX RM package last year [as well as the “Return To Eden” 2xCD+DVD live album from 2010] in a much better designed package. One that adapted the original limited edition UK LP design with it’s gloss black on matte black design, courtesy of Peter Saville. 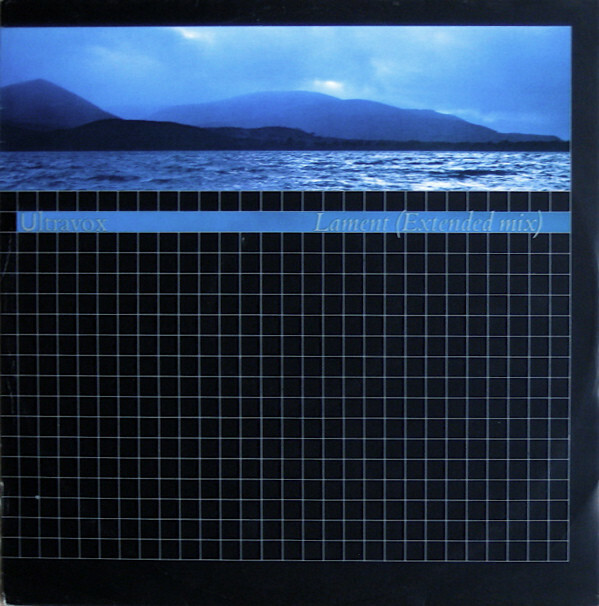 The original in 1984 was Saville revisiting the thermographic printing from the dawn of his career that made the OMD debut single so brilliant. We’ve covered the original “Lament” album before, so we’ll just get to the particulars of the bonus materials here. The first single from the album was the roaring rocker “One Small Day,” which was released in two different 12″ singles in the post-ZTT environment of the time where such things just happened. The first mix [Special Re-Mix] was an extended version with a longer intro and some nice dub influenced drop outs in the long coda. Pretty good for an Ultravox remix as they did them themselves and it was a gentler time of remixing. The non-LP B-side, “Easterly” was a vaguely oriental instrumental that had Midge Ure’s fingerprints all over it. Not inspiring stuff, and it really was of a piece with the track “Textures;” an earlier B-side from his single with Mick Karn. A lurching percussive track with blatant Yamaha DX7 all over it. The extended version of the “Lament” single was the most straightforward way possible of doubling the length of the 4:00 somber ballad to twice its length. Just more breathing room for the song with instrumental vamping inserted [tastefully] at every juncture. The more languid pace given to the song actually increased its gravitas enough to make it my preferred version. Your mileage may vary. Back in 1985, when I got the 1st UK CD of “Lament” I was surprised by a version of “One Small Day [Special Re-Mix Extra] included on the disc. What I didn’t know for decades was that there was a second, numbered 12” of “One Small Day” at the time which sported this particular mix. I still don’t have a copy today, but would buy it if I had the chance. The actual mix is the original given a thunderous remix with what sounded like samples of the original played on a sampler along with a dubbed out backing track. Almost no lyrics appeared here; just sampler stuttered vocal snatches played out over the big, stomping rock sound. The mix was pretty radical for Ultravox and even more interesting [as sound at least] to the first re-mix. This was all about successfully incorporating dub technique to a rock sound. The 10:00 extended version of “Dancing With Tears In My Eyes” always felt like the sound of a song being stretched to its limit to my ears. The mix had an extended intro that chugged along for four or five minutes before the song proper appeared with the vocal performance in the mix. Punctuated by dropouts to air it out more with more timid dub effects. I still preferred the US mix by Thompson + Barbiero that is just getting a CD release on the new “Ultravox: Extended” compilation. 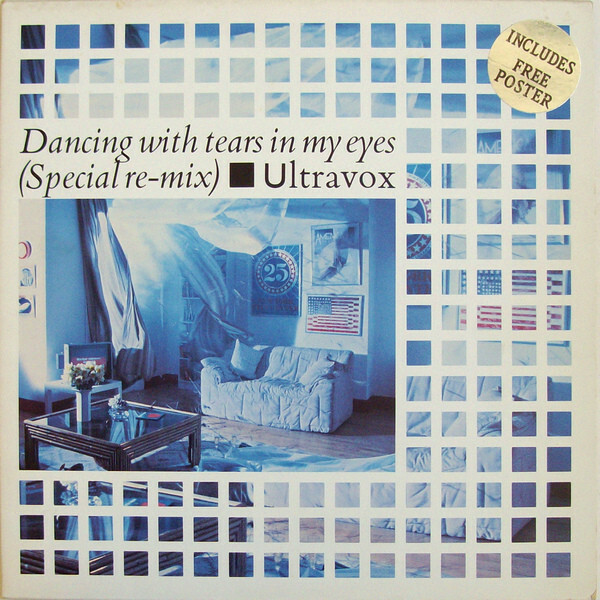 The B-side to “Dancing With Tears In My Eyes” was a rarity among Ultravox B-sides at this point in their history since it had vocals! They were productive enough to have the treadmill running at top speed for the album a year they delivered so B-sides after “Rage In Eden” were instros. “Building” was a doom-laden piano ballad with no other instrumentation. It was a jazzier cousin to “Your Name [Has Slipped My Mind Again]” and it was interesting to hear just Ure and Currie having a go at it. Cann delivered a portentous and minimal beat halfway through the song. A very interesting number and I would have liked to have heard some Ure solo material in this vein. The “White China [Special Mix]” was another original CD bonus track with a fantastic remix of the best song on “Lament” and let me say a real selling point to the CD version of the album for decades. The song was obviously earmarked as a potential single but for some stupid reason, it didn’t happen. Thankfully, the band were always generous with the mix; getting it out there from day one for the fans. The mix ramps us the heavy-handed dynamism [nothing wrong with that…] of the LP track most admirably. Some of the breaks here were completely berserk! It was invigorating hearing the band investigate some of their new digital tech in the most tasteless way possible. I also liked the new EQ on Ure’s vocals in the mix which isolated them them in the mix so that they popped out more. “Heart Of The Country [Instrumental]” was the tepid B-side to the “Lament” single but an opportunity was missed here since the German-only 11:00 [!] 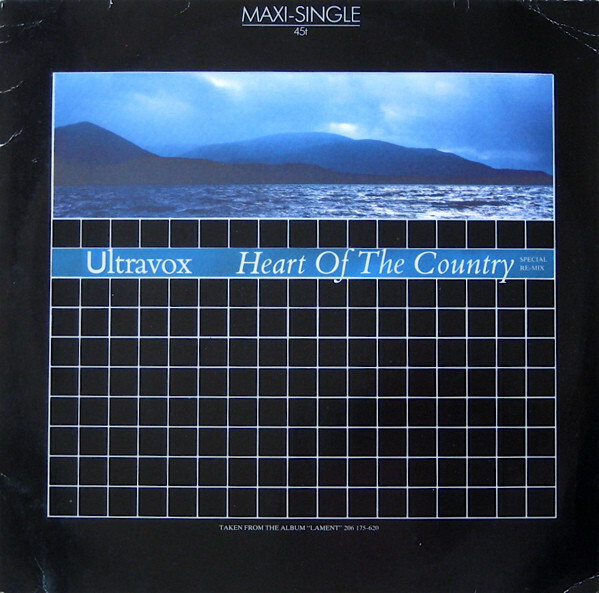 “Heart Of The Country [Special Remix]” version is ultimately missing from this “Definitive Edition.” There’s small solace that it is on the aforementioned “Ultravox Extended” collection, but a small part of me grieves for its omission here. Even though I’m no fan of the mix in particular. I am a Monk, after all, and interested in canonical wholeness. Let’s feel better with the “One Small Day [Final Mix]” playing out at full volume to be the best mix of the song ever. This originally appeared on the bonus remix album with the first pressing of the 1984 “Collection” best of LP. The synth quotient of the mix was goosed for this remix and the arrangement was given a real makeover. The subtle intro with just bass and Ure’s vocal at low levels had a dignified power that made the introduction of the booming drums all the more dramatic. The middle eight dropped out the instruments to give the bass of Cross a chance to shine in the mix. Twice! The dubbing of Ure’s vocal of “how many times” was great stuff. I would have liked to see them pursue this sound instead of sacking Cann and going off the rails. I would have been fine with more of this from the band. The work in progress mix of the title track was more subtle in its allure. The meter of the synth vibes used to offset the beat had changed here to give it a little more of the old JAPAN rhythmic push/pull. You would have to put these stacked in a DAW to pick out the very subtle differences to the extant “Lament” in its instrumental form. Only the different breakdown in the coda was immediately noticeable. This was a good package. Save for the lack of the German and US remixes, it is [UK] canonical. The printing and design was a real treat here for the CD format. 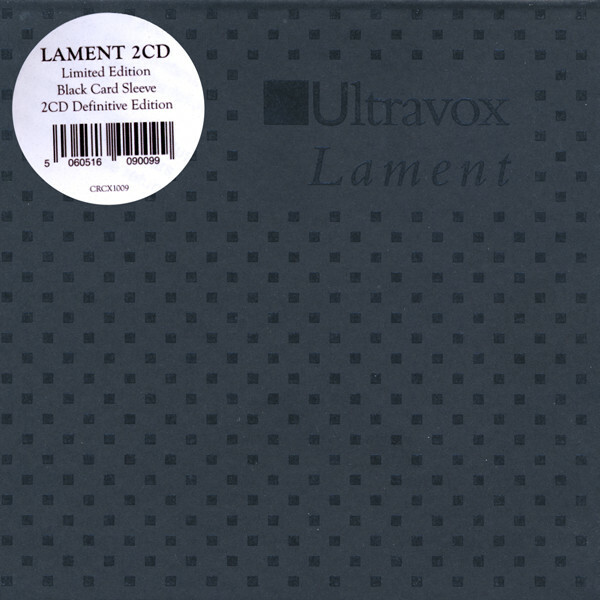 This was by far the best looking “Lament” CD ever, and it’s worth buying just for that if you’re a graphic designer that collects Ultravox. That’s an important consideration, because the two tracks exclusive to this edition were modest pleasures at most. If you have “Rare v. 2,” “Extended Ultravox,” and the original CD you could take a pass here. Thematically, it’s good to have this release as a capstone on the run of Ultravox MK II. Had it all ended here in 1984, it would have been for the best. This entry was posted in 30 Days - 30 Albums, Core Collection, Designed By Peter Saville, New Romantic, Record Review, Scots Rock and tagged 1984, 2009, 2017, DLX RM, Lament, Ultravox. Bookmark the permalink. Recently Midge shared that the band wanted White China to be the first single but were told it sounded too similar to Blue Monday (??!! **) so were pushed to release One Small Day which was their least successful initial single release since Sleepwalk in the UK but still got four different extended/remixes. All their other singles either got none or one, if you don’t count the ‘unofficial’ (according to the band) Thompson Barbiero mix of Dancing With Tears In My Eyes. For me Lament just seemed like UV on autopilot giving the management yet another version of the Vienna album after Quartet had also mirrored it. The band lost all creativity following ‘Rage In Eden’ (which I feel is their masterpiece which hasn’t aged as badly as the rest of their catalogue) and just did what the accountants wanted, which finally resulted in UVOX. I have to agree with Richard here, Ure era Ultravox reached such lofty peaks with Rage In Eden, they would have had to work themselves into the ground artistically to come up with anything that equalled it. I feel like Quartet suffered from a combination of this, meddling from the record company and the wrong producer. I’m sure there are those who will fight me on that last part. Lament is an album I always want to love, or think I remember I love, but when I listen to it start to finish, I remember that it was one where the needle was picked up and dropped down. I wish that One Small Day and White China didn’t exist. They always seem to offend me as an Ultravox fan. Echorich – I was a slow convert to “One Small Day” and now I like it fine as Ultravox’s lone excursion into The Big Music. On the first ten listens it was “where’s the synthesizers??! !” Ten years after the fact I started to really like it. From the first second I thought that “White China” was slick as hell and a fantastic [if unbelievably atypical] song. A non-existant outlier to Ultravox’s excursion into AON territory hot on the heels of “Into Battle.” The songs on “Lament” I wish didn’t exist were “Man Of Two Worlds” and “When The Time Comes.” Maybe “A Friend I Call Desire,” as well! I like the whole album, start to finish. Rage in Eden is great because it does what it does so able, this album is great for exactly the same reason. It is no RiE but it is a fantastic collection of pop songs. Tim – You were obviously the target audience for this album that the rest of us seemed to have problems – highly individualized problems with. Did you like Ure’s solo stuff too? The 1st one, yes, after that……not so much. Richard Anvil – Chrysalis were daft! “The Cure’s “The Walk” was too similar to “Blue Monday! !” “White China” was more than enough it’s own song, and besides. What’s wrong with being to any degree similar to a song that sold 250,000 copies on 12″ single anyway??!! What drugs were Chrysalis A+R taking, anyway? I never found any album of the band similar to “Vienna” which was a bit of a melange to my ears. “Rage In Eden” was their magnum opus and the far strongest of a piece! “Quartet” was the sound of the last drops of New Romanticism draining from the the cup, leaving it dry. “Lament” was a thrown together meal from whatever was in the cupboard that didn’t gel at all, except for side two, which pointed the way forward to Midge Ure’s solo career. Can you please provide a link to where Midge says that about White China? It’s interesting because, according to his autobiog, One Small Day was their choice of a first single and then they wanted to release WC in the UK with Dancing… worldwide – but it was Chrysalis that interfered, wanting to release Dancing… as a first single and prodding the band to agree to release it as a second everywhere. Sounds like he tries to put the blame of a (comparative) flop of a single on the record company. Something which he opposed to in the 1980s, by the way, saying that musician’s fails are primary to the label’s. Cann and Cross, too, were of the same opinion, saying that after the success of Vienna it was the band that decided on singles and that Chrysalis had too many “yes” people in that regard. Vlad – It’s been a few years since I read Ure’s autobio but I’ll review it later on. It was news to me that “White China” was mooted as the pre-release single until this discussion. Obviously, since they had created the remix up front there was thought of it being a single at some point, before that idea got tabled. Yes, of course it was – after One Small Day :) In fact, speaking of the singles it’s my major itch that WC wasn’t released after Dancing – they could’ve easily maintainted the level of success reached with that, seeing as the song’s so danceable and full of those wonderful production tricks. A sure-fire hit that never was. Certainly a much better choice of a single for the Summer of 1984 than “Lament”. And it was, as I understand, a prefferred choice of the US radio stations – at least of KROQ, so maybe it was a chance to break the US finally? I love the extended Lament for the reasons that you cite here. One of the best 80’s extended mixes, it just beautifully complements the song. Back in the mixtape days I used to play that mix with the Eurythmics Julia playing in and out of it. The occupy a similar emotional tone…. Tim – Good segue! Imagine the horror if this song had been released four years later! “Lament [Shep Pettibone House Mix]!” Arrrrrgh! Tim – As sampled from Martha Wash singing it!!! Wow, I am aghast at all the disdain for One Small Day around these parts. It’s one of my favorite songs, by any artist, from the year it came out. A towering achievement. It’s the only song on the album that convinces me that Ultravox meant it when they played it. If the rest of the entire Lament album vanished, and One Small Day had been a stand-alone single, I’d be fine with that. (I did like White China a lot when it was new, but it has not aged well for me, it sounds gimmicky and doesn’t hold up for me). JT – I hear you on “One Small Day.” It’s a powerhouse by the band that was a slow grower for me but that reluctance was over and done with 24 years ago. Since then it’s been the classic song from the album for me. You’re absolutely right about the sincerity of it as well. Ultravox with Ure were often bloodless technicians; dazzling of technique but bereft of passion. In other words [put your fingers in your ears, Echorich] Prog. “One Small Day” may [shockingly] ease up on the technique but it ramps up the passion to heretofore unknown levels with this band. And it all feels completely real. I knew that was coming…but I am not convinced of anything other than Ultravox did just enough to sound sincere on One Small Day. It’s the anthemic, Midge does Bono feel of the song that I can’t buy into. The Voice is how Ultravox does anthemic – when I saw them at Avery Fischer Hall oh so many decades ago, it was this song that had people singing along in unison during the chorus, standing on the velvet seats and driving the concert hall ushers to distraction. I just can’t ever hear One Small Day in that way. I have to concede the Bono influence in OSD, but (this may make me unpopular around here), U2 was not without merits until (or perhaps through) Unforgettable Fire. A lot of my pals pre-1985 loved U2 as much as we loved the rest of the post-punk canon, but we all ran away quickly when the band (or mostly Bono, perhaps) became insufferable around the time of Unforgettable Fire, which was also when their towering success made them uncool. Back to the ‘vox, I do adore The Voice, and I agree that Rage in Eden is their high water mark, but tell me this: what part of the lyrics to The Voice do you relate to? What were the crowd singing along to it at Avery Fischer Hall thinking the song meant? I’ve been listening to that song with no small measure of joy for something like 35 years but I couldn’t begin to tell you what it’s about. OSD on the other hand, is real because it’s words contain something we can all relate to. JT – On U2 I never heard the first note from “Boy.” I was aware that there were a lot of people [even critics] who loved this band, but I was never exposed to their music. I have never heard the first note from it to this day. I have only seen the live video on MTV for “I Will Follow.” I’ve never heard the studio version. Eh. I saw the video for “Gloria” on MTV once we got it in Sept. 1982, but prior to that I had read interviews with Bono where he was pridefully flinging his christianity around like a feather boa and it made me hate him right then and there. The rest of the band were never so good that I would bother to investigate at that time. I saw the two videos from “War” on MTV as they got a lot of play. They were …okay. I bought the “Two Heart Beat As One” UK 2×7″ [used] with the remixes on disc two but was unmoved. A friend was in the process of going ape**** for U2 so I gave it to them. So yes, I did own a U2 record for at least six months! I hate Bono a lot more 36 years later. None of the 12-inch remixes taken from the Lament album spoke to me but I thought the parent album was quite listenable. The remixes were typical of that time, not very creative and simply too long. They have not aged well. I enjoyed the tracks One Small Day and Lament the most. Rage in Eden was them at their apex I think everyone will agree. Quartet was also very enjoyable. More song-oriented perhaps and less atmospheric. I am sure George Martin knew his way around a hit. How U-Vox came into being I will never know. Jordan – In this we can all agree that “Rage In Eden” was a never-to-be-repeated event in the Ultravox canon. That they wrote it in their three month studio residency in Germany with nothing created up front meant that all of the pressure they felt was manifest in their art. To its benefit, if not their states of mind. Conny Plank should have never agreed to produce “U-Vox,” but seeing as how he was dying at the time, he was probably not using good judgement. I’m sure he was concerned with his family’s finances once he was gone and was not turning down any work that came his way. and it’s my second favorite album. concept album, that i rarely, if ever listen to. in eden out of the water. all his singles, side groups,etc. they are one of my all-time favorite bands. getting all of them also. they come out with them. i can never have enough ultravox. of synth and progressive bands. I concur with you Mr Monk. 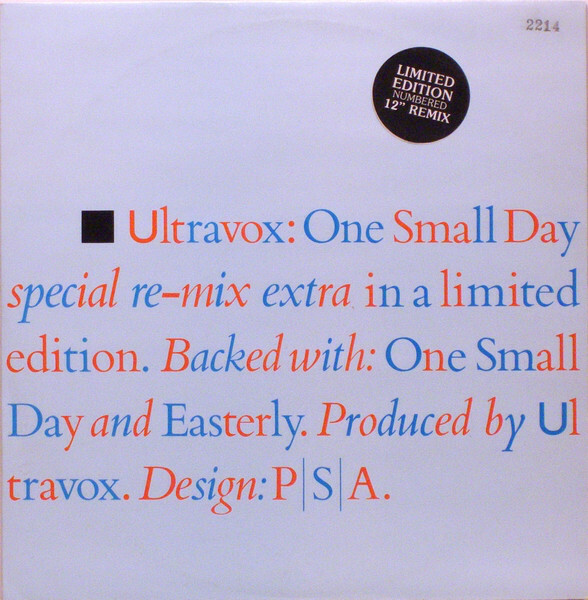 The Final Mix of One Small Day was the finest ever on its release (an ultra-limited edition 12 vinyl single at the time – probably two-a-penny now) but superb. It showed the song off to its full glory. Given I am in Scotland. maybe we Brits preferred One Small Day but we also really considered it a Scottish album, given where it was recorded! Just after I wrote it, I wondered if my mind was paying tricks on me. Whatever the issue format (I had the limited edition double-play cassette of The Collection so the mix was on that tape!) it is still the perfect mix of that great song! Hey man, if you’re a reader of this blog, your opinion is valid, at least to me, even if I don’t fully concur. So to dive in to this multi-album discussion: I remember thinking (and writing when I wrote my review) that Rage was more of a transition to some new place they were going to creatively … but sadly they never got there. The album probably didn’t do the numbers they were expecting on it, and so they retreated (again, in my view) to as others have said Vienna mks II and III. Because of that, I concur with the view that RiE is their high-water mark creatively (at least since Foxx left). There’s still plenty to like about Lament, though, since it was drawing inspiration from another one of their great albums. At the time, I noticed the soaring/U2 comparisons with OSD, but I still like the song (and White China, and Lament, et al) as explorations of the same “mine” they worked for Vienna. When you’re pulling out diamonds, you wanna go back and make sure you got all the diamonds! Ha! As for U2/Bono: after a period where I enjoyed each of their releases, they entered their hit-and-miss phase, and I lost interest around the time of Achtung Baby. Essentially they, like Bowie, produced little of interest after the 80s until they got some of their mojo back in the 00’s. I can still find songs of theirs that I think are good, looking over their output since 2000, but it’s more of a second hit-or-miss era with me. Well, that was the second album after Vienna that I’ve heard from the band – and while Vienna (on first listens) just washed over me for some reason, Lament registered since play one. To this day it’s usually my second favourite from the Vox. So maybe I’m biased but I can’t really see what’s wrong with it. It’s a stellar record from start to finish, there’s no filler, every song has character and something to recommend to it. Yes, it’s kind of eclectic (though there are strong unifying features anyway) but the band were clearly trying to evolve while preserving their legacy – and to my ears they did so admirably, showcasing both their tried style and new ideas. Scottish/Celtic influences were a great addition, giving their music a new flavour instead of that New Romantic sentiment which by 1984 was all but washed and wasted. And it gelled with their classical motives really interestingly. In fact I think they should’ve continue mining the same vein as it wasn’t in any way exhausted on Lament. 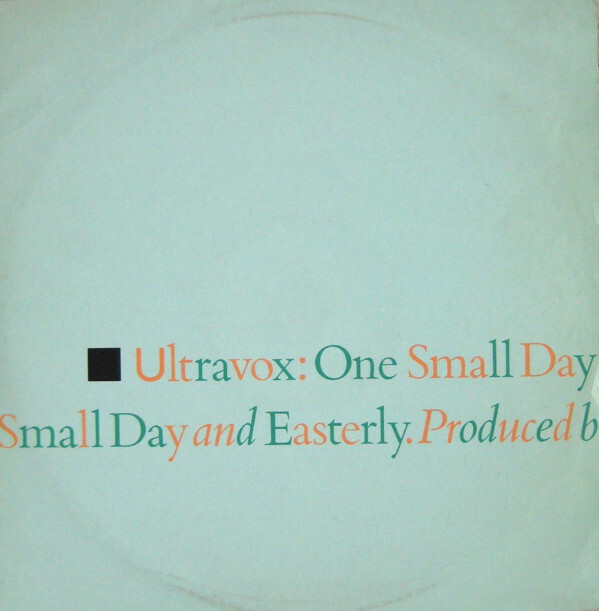 And Eastern influences, apparent on “Easterly”, could also have been a very welcome component and a way forward – in fact B-sides of U-Vox singles provided a different way for the band, a more sountrack-y, atmospheric, soundscapey. Probably not as commercial but much more interesting creatively. I also don’t agree that with Lament the Vox tried to copy Vienna. There’s practically nothing to support that notion. Album’s construction is different, the sentiments in songs are different (much more “real”, clearly understandable), Midge’s singing noticeably evolved etc. And the production is great, by the way – Midge clearly learned quite a few tricks from the great Conny Plank, but he’s an able producer in his own right and on Lament he was at the helm, doing a great job.